January 17, 2017 - Four golfers from the Greater Pittsburgh area bested the competition at the National Kidney Foundation Golf Classic Finals, the Premier Amateur Golf Event for Charity™ held January 13-15 at the legendary Pebble Beach Resorts in California. Tom Ali, CEO for Triad Engineering, of Venetia PA; Mike Sobota, Director for Thermo Fisher Scientific of McMurray, PA; Mark Turley, Senior Director of Partnership Sales & Media for the Pittsburgh Penguins of Pittsburgh, PA; and Joseph Winklmann, Service Manager for Tech Pro Building Services of Pittsburgh, PA, finished in first place in the Handicap Index Division. The team shot rounds of 59-63-64 for a three-day total of 186 in the four-person scramble. In the Gross Division, Mark Upchurch, Agent at State Farm Insurance of San Diego, CA; Daniel Mezich, CEO of Famoso Ltd. of Del Mar, CA; Joe Dufek, President of Joe Dufek Insurance Agency of Scottsdale, AZ; and Michael Dufek, HRC Manager for NCSA Athletic Recruiting of Chicago, IL, finished in first place with rounds of 61-56-55 for a three-day, 172 total in the four-person scramble event. Both foursomes qualified for the National Finals via their top finishes in NKF Golf Classic events during the 2016 season. In the National Finals, they faced off against 59 other amateur golf teams from across the country and played the fabled fairways and signature holes of the Monterey Peninsula: Pebble Beach Golf Links, Spyglass Hill Golf Course and The Links at Spanish Bay. 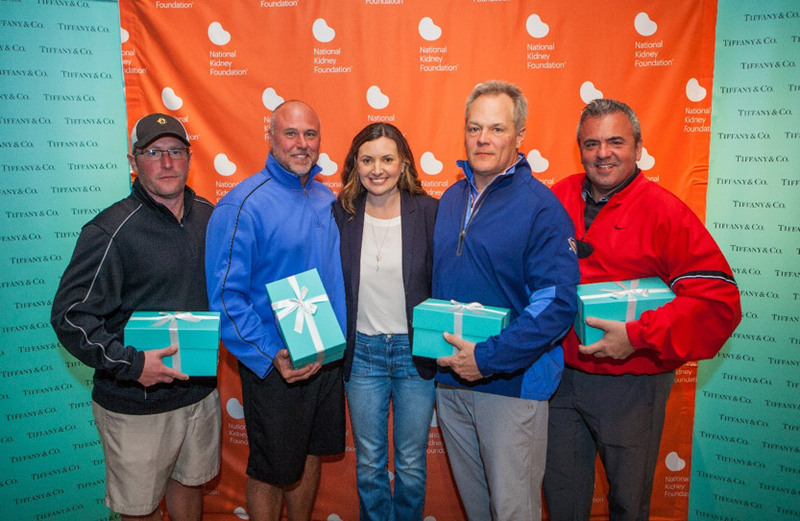 The NKF Golf Classic, a nationwide series of more than 30 golf tournaments held in major cities across the country, is the Premier Amateur Golf Event for Charity™ raising more than $3.5 million each year and exceeding $100 million to date. For information about an upcoming event near you and the next opportunity to qualify for the National Finals at Pebble Beach please visit www.NKFGolfClassic.org. The NKF Golf Classic national corporate partner is Insurance Auto Auctions / One Car One Difference. The National Finals partner is HM Insurance Group. National promotional partners are CBRE, Golf Digest, the Greg Norman Collection, PING, Skechers, and Tiffany & Co. For more information about the NKF Golf Classic, visit www.NKFGolfClassic.org. The National Kidney Foundation is the largest, most comprehensive and longstanding, patient centric organization dedicated to the awareness, prevention and treatment of kidney disease in the US. For more information about NKF visit kidney.org. (L-R) The team of Joseph Winklmann of Pittsburgh, PA, Tom Ali of Venetia, PA, Amanda Thompson of Tiffany & Co., Mark Turley of Pittsburgh, PA, and Mike Sobota of McMurray, PA won the Handicap Index Division at the National Kidney Foundation Golf Classic National Finals held in Pebble Beach, California January 13-15, 2017. The Pittsburgh, PA based foursome also won their local NKF Golf Classic tournament last season at Valley Brook Country Club and qualified for the National Finals, along with close to 60 other amateur golf teams from across the country. They played the fabled fairways and signature holes of the Monterey Peninsula: Pebble Beach Golf Links, Spyglass Hill Golf Course and The Links at Spanish Bay. To register for an upcoming NKF Golf Classic, please visit NKFGolfClassic.org. (L-R) The team of Mark Upchurch of San Diego, CA, Michael Dufek of Chicago, IL, Amanda Thompson of Tiffany & Co., Daniel Mezich of Del Mar, CA, and Joe Dufek of Scottsdale, AZ won the Gross Division at the National Kidney Foundation Golf Classic National Finals held in Pebble Beach, California January 13-15, 2017. The foursome also won their local NKF Golf Classic tournament last season at Sewailo Golf Club and qualified for the National Finals, along with close to 60 other amateur golf teams from across the country. They played the fabled fairways and signature holes of the Monterey Peninsula: Pebble Beach Golf Links, Spyglass Hill Golf Course and The Links at Spanish Bay. To register for an upcoming NKF Golf Classic, please visit NKFGolfClassic.org.